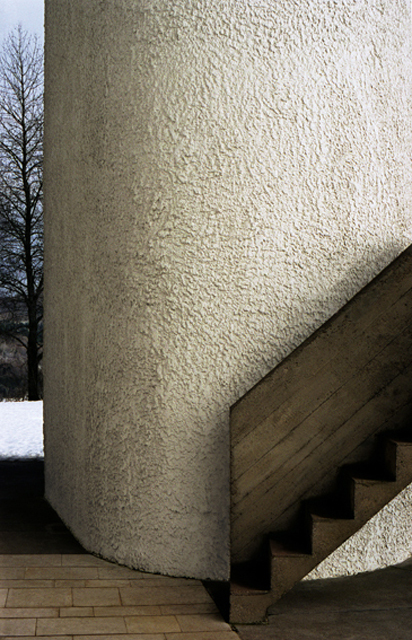 Informally known as 'Ronchamp', the chapel of Notre Dame du Haut in Ronchamp (French: Chapelle Notre-Dame-du-Haut de Ronchamp), completed in 1954, is one of the finest examples of the architecture of Franco-Swiss architect Le Corbusier and one of the most important examples of twentieth-century religious architecture. The structure is made mostly of concrete and is comparatively small, enclosed by thick walls, with the upturned roof supported on columns embedded within the walls, like a sail billowing in the windy currents on the hill top. The main part of the structure consists of two concrete membranes separated by a space of 6'11", forming a shell which constitutes the roof of the building. This roof, both insulating and watertight, is supported by short struts, which form part of a vertical surface of concrete covered with 'gunite' and which, in addition, brace the walls of old Vosges stone provided by the former chapel which was destroyed by the bombings. These walls which are without buttresses follow, in plan, the curvilinear forms calculated to provide stability to this rough masonry. A space of several centimeters between the shell of the roof and the vertical envelope of the walls furnishes a significant entry for daylight. 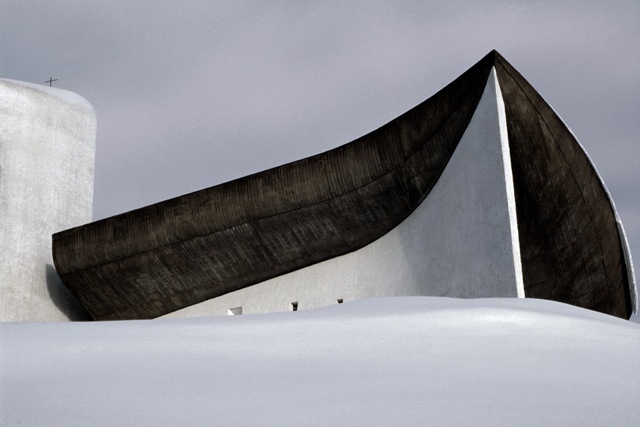 The floor of the chapel follows the natural slope of the hill down towards the altar. Certain parts, in particular those upon which the interior and exterior altars rest, are of beautiful white stone from Bourgogne, as are the altars themselves. The towers are constructed of stone masonry and are capped by cement domes. 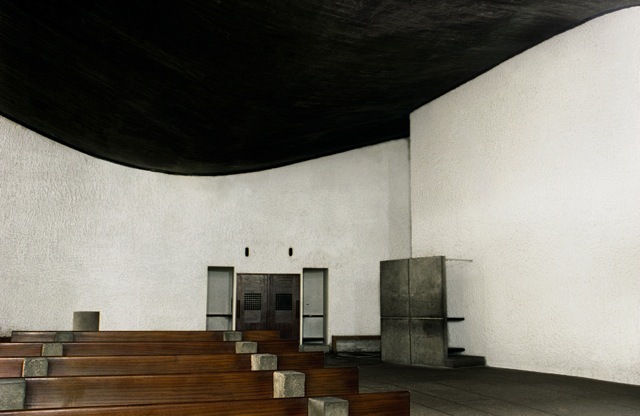 The vertical elements of the chapel are surfaced with mortar sprayed on with a cement gun and then white-washed - both on the interior and exterior. The concrete shell of the roof is left rough, just as it comes from the formwork. Watertightness is effected by a built-up roofing with an exterior cladding of aluminium. 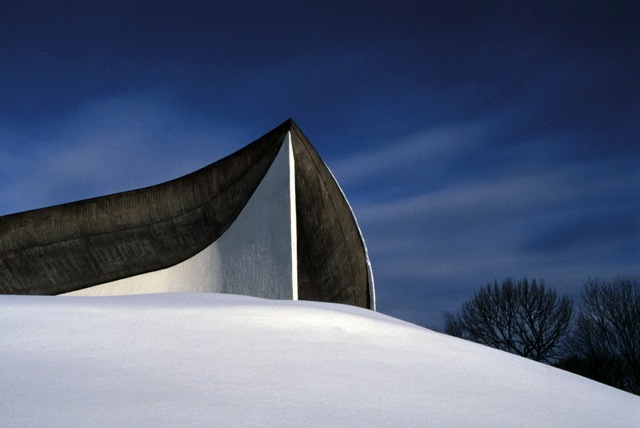 The chapel at Ronchamp is singular in Corbusier's oeuvre, in that it departs from his principles of standardisation and the machine aesthetic, giving in instead to a site-specific response. By Le Corbusier's own admission, it was the site that provided an irresistible genius loci for the response, with the horizon visible on all four sides of the hill and its historical legacy for centuries as a place of worship.